The 26-County gardai this week conducted a series of ‘disruptive’ raids and arrests on the homes of republicans in advance of a royal visit to Ireland by Britain’s Prince Charles. A piece by Eamonn McCann for the Irish Times on the sycophantic attitude of the Irish establishment to British royalty. Princess Charlotte has committed a fashion faux pas. Reports in the Daily Telegraph and Daily Mail last Friday revealed that, in her first public engagement, on the steps of the Lindo Wing of St Mary’s Hospital in Hyde Park, the princess had worn her bonnet back to front, after the manner of a hip hop artist’s baseball cap. Still, pictures of the princess in her bonnet “melted the hearts of a nation”, the Telegraph alleged. “New parents rushed to copy her look . . . Kensington Palace declined to say where the bonnet had come from.” The palace’s reticence didn’t deter the investigative sleuths of the British press. Assiduous digging by the Mail unearthed intelligence that the bonnet had been bought from a Spanish boutique, Irulea in San Sebastian, by the mother of the royal couple’s nanny, Maria Teresa Turrion Borrallo. The Mail also had the first interview with the owner of Irulea, Susana Villar, who professed herself “delighted”. As we know, this is standard fare in royal reporting. Watch the way a rictus grin becomes affixed to the faces of television news readers when the latest piece of palace puffery slides into view on the autocue. Embarrassingly, sections of the Irish media follow suit. In part, this is on account of the relentlessly promoted but wholly nonsensical notion that being nice to the royals is a necessary condition for fulfilment of the peace process. Additionally, there’s post-colonial sleeveenism. Thus, any citizen who describes Prince Charles during his imminent visit to Ireland as an absurd poltroon will be presented by predictable columnists as a very bad egg altogether. 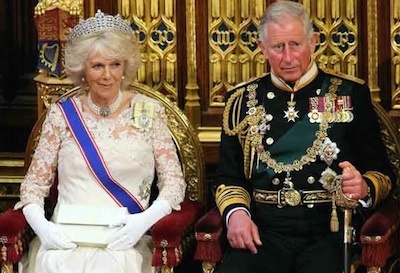 Charles’s insolent self-importance has been nowhere more evident than in the saga of his “Black Spider” letters, written to seven different government departments, including the Northern Ireland Office, in 2004 and 2005. The Guardian was able to publish 27 of the letters yesterday after a 10-year freedom of information fight. The supreme court had ruled that then attorney general Dominic Grieve had acted unlawfully three years ago in forbidding release of the letters. Grieve’s reasoning was instructive: the letters must be kept secret because they expressed Charles’s “most deeply held personal beliefs”, couched in some instances in “particularly frank” terms. Publication, Grieve warned, might damage public trust in royal neutrality - rather a good reason, many might think, for splashing the letters across front pages. The UK government has since moved to plug the gap, allowing the public a peep at the prince’s political manoeuvres by inserting an “absolute exemption” for the monarch and heir from freedom of information provisions. Charles doesn’t take it from the back stone. His mother has been interfering in politics for years. Her most blatant recent incursion came a few days before the Scottish referendum when she barged into the campaign to urge voters to “think carefully”. We have David Cameron’s word for it that she “purred with pleasure” when he phoned the palace after the poll to tell her the outcome. And then there was the Abu Hamza affair. In September 2012, BBC security correspondent Frank Gardner told the Radio 4 news programme Today that the queen had told him at a reception that she had been “aghast” and had complained to ministers that the radical Muslim cleric had not been arrested for preaching anti-western sermons at the Finsbury Park mosque. Instead of celebrating this major exclusive, literally within the hour BBC executives were falling over one another in the rush to apologise for their news department having reported a legitimate piece of news. Gardner was made to consume sizeable portions of crow. No British newspaper argued in favour of broadcast of the story. Nor did any MP take up the cudgels for freedom of speech. We haven’t heard Commons talk of royal mischief since the retirement of Labour MP for Fife Willie Hamilton in 1987. The reputation of the royal family is sustained by flim-flam, flummery and conspiracy of silence. It is greatly to be hoped, if only for the dignity of the land, that there’s as little as possible of this demeaning behaviour in the coming weeks. But I fear the worst.